A trial balance, sometimes abbreviated to TB, is a list of all the account balances in the accounting records on a particular date. The trial balance is useful for checking the arithmetic accuracy and correctness of the bookkeeping entries. Under the double entry bookkeeping method for every debit there should be a credit so a list of all the balances in the accounting records should balance. Until a trial balance balances you cannot start the preparation of the Financial Statements. 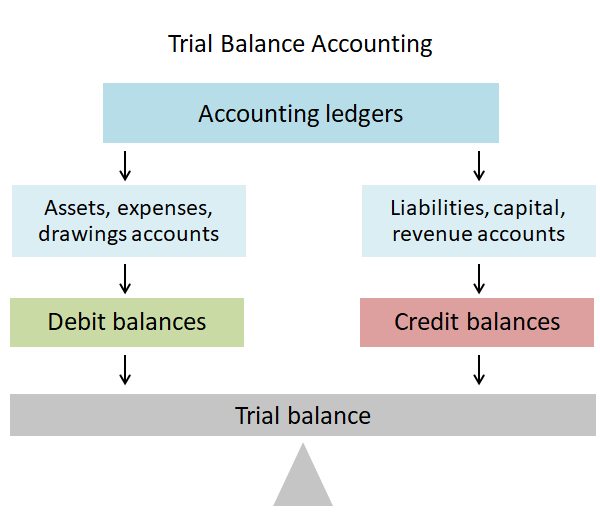 It is important to realize that although a trial balance may in fact balance, there may still be errors in the accounting records. 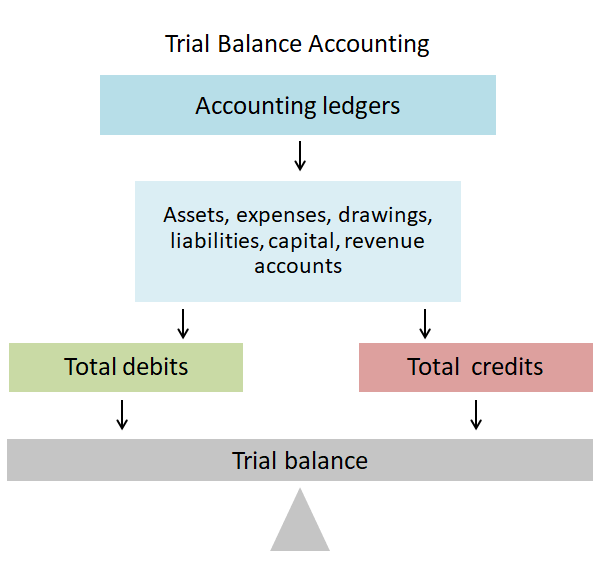 How do you Prepare a Trial Balance? The process of obtaining a TB is often referred to as extracting a trial balance. There are two main methods of preparing the TB. In this method the totals of the debit side of the account are entered in the debit side of the trial balance, and the totals of the credit side of the account are entered into the credit side of the trial balance. The trial balance extraction takes place at a particular date, usually at the end of the accounting period. In the example above the TB extraction date is 31 December. The ‘Account’ refers to the name of the account in the general ledger. The total debits on the account are under the debit column, and the total credits on the account are under the credit column. The debit and credit columns when totalled should be equal or there is an error in the accounting records or the TB preparation. Any errors must be investigated before proceeding to the next step in the accounting cycle. The most common method of preparing the TB is for each individual account to be balanced off to give a net debit or credit balance on the account, the balance is then entered on the debit or credit side of the trial balance as appropriate. Again, the trial balance in the example above has been extracted at 31 December. The ‘Account’ refers to the name of the account in the general ledger, and the balance extracted is included under the debit or credit column as appropriate. The debit and credit columns when totalled should be equal or it indicates an error in the accounting records or the TB preparation. The error needs to be investigated before proceeding to the next step in the accounting cycle. Why do you need a TB? The TB is not part of the accounting records, it is extracted from the records as part of the accounting cycle to be used as the starting point for the production of the Financial Statements. It is a basic check to ensure that your accounting records balance, that the accounting equation has been satisfied, and that every debit had a corresponding credit. If the TB does not balance, assuming it has been prepared properly, it means there is an error in the accounting records. The balancing of the TB does not however mean that the accounting records are correct, it simply means that for every debit there was a corresponding credit. It does not tell you that the debits and credits are correct or whether both sides of an entry have been completely missed out of the accounting records.